Please contact the Mayor Gallery if interested. Provenance is a very important aspect to book collecting, and the provenance of these titles is, directly, people related to Sylvia Plath: Frieda Hughes and her aunt Olwyn Hughes - Ted Hughes's sister. This summer, Dr. Sally Bayley and Linda Gates will teach a Sylvia Plath Interdisciplinary Master Class entitled "Finding a Voice: Sylvia Plath's Poetic Landscapes" at Oxford University in England from 2-6 July 2012. "This class will take a selection of Sylvia Plath's poetic manuscripts as a starting point for exploring the process of Plath's poetic composing. The particular focus will be on Plath's mature landscape poems, Winter Trees, Crossing the Water, Little Fugue, The Moon and the Yew Tree and Elm in which the speaker devises and revises a poetic identity through several drafted stages. The quotient points of her identity shift between inner and outer worlds as the poems come into focus and her personae begin to speak. "At the heart of the class will be the subject of voice and the ways in which Plath’s poetic voices are developed and tuned through the process of drafting. "Led by Plath scholar Dr. Sally Bayley of the Rothermere American Institute, University of Oxford, and Linda Gates, Professor of Voice at Northwestern University, the class will be aimed at students studying Plath as a subject of research and students of literature, drama, voice and music at the undergraduate and graduate level. The class has been designed to be strongly interdisciplinary and will include a session on Plath’s poetry as translated into songs for voice by composer and scholar, Dr. Will May of Southampton University. "Teaching will be focussed on close readings of poems in draft and published forms and students will be encouraged to read across drafts, drawing connections between aspects of Plath’s poetic imagery. At the heart of the class will be an investigation of Plath’s mythopoeic body. Students will be supported to make observations and notes on Plath’s journey into a poem with the aim of preparing a final performance piece to be led by Professor Linda Gates. "Further information is available on the website including: Programme Foci, Programme Outline, Masterclass Tutors, and Suggested Reading." It should be noted that class space is quite limited to about 20 people and currently enrollment is open to all. While I do not know Ms. Gates, Sally Bayley is a dynamic Plath scholar. This course structure will extend the boundaries of Plath interpretation, including the relationship between the spoken voice and music in Plath's landscape poems. Rogers, Janine and Charlotte Sleigh. "'Here is my Honey-Machine': Sylvia Plath and the Mereology of the Beehive." The Review of English Studies. November 21, 2011: 1-18. And, please do not miss Plathery's birthday cake. It is not a "cake of soap," though there is a dish detergent called Ariel in England. Can't we just picture Plathery "Measuring the flour, cutting off the surplus"?? Sylvia Plath visited Richard Norton at Ray Brook near Saranac Lake in New York in late December 1952, she broke her leg skiing on Mount Pisgah: her fibula to be exact. In a letter to Myron "Mike" Lotz, she recounts rather vividly the event which took place on 28 December. She tells him that as she cartwheeled down the mountain a song was playing on the loudspeaker. Did you know... that the song playing was "You Belong To Me." There were a couple of versions of this song out in 1952; the above by Sue Thompson appears to have been the first, but a cover version by Jo Stafford was also near the "tops in pops," as Lenny Shepherd would say. The last day of an archival research trip is always a day I do not look forward to at all. The time seems to go neither too fast nor too slow, but inevitably there is not enough of it. This morning I again called for the boxes of Plath's poems, particularly those of October 1962, but also of January 1963. Specifically "Ariel," "Lady Lazarus," "The Munich Mannequins," and "Totem." As I type this, from the Mortimer Rare Book Room, draft 1, page 1 of "Ariel" stands right beside me. An inspiration on its rosy pink paper, the false start quickly corrected: the trot turns into a gallop. Three days after creating "Ariel," Plath did her famous interview with Peter Orr of the British Council. She was right when she said, "Poetry, I feel, is a tyrannical discipline, you've got to go so far, so fast, in such a small space that you've just got to burn away all the peripherals. And I miss them! I'm a woman, I like my little lares and penates, I like trivia, and I find that in a novel I can get more of life, perhaps not such intense life, but certainly more of life, and so I've become very interested in novel writing as a result." You can see this in practice in drafts such as "Ariel" and "The Munich Mannequins" for they come together very quickly. Even in poems like "Lady Lazarus" which is longer and took longer to realize, the tyranny of brevity is clear. In the draft of "Ariel" Plath starts out calmly, almost. The writing is her classically recognizable combination of deliberate printing and cursive. Unlike many of the other October poems, "Ariel" (as well as "Poppies in October") is created on fresh pink Smith College memorandum paper. Fresh as in not recycled; a sheet paper blank on verso, whereas many of those other poems were drafted on the back of drafts of The Bell Jar, or from Ted Hughes' papers, for example. The first five lines of "Ariel" are struck through. A false start, the footing was right; or her feet weren't properly in the the stirrups. Then magically, she breaks through: "Stasis in darkness, then the blue". "Substanceless" is added in after the fact. The structure of the draft is quite different looking to the poem in its final form for in the final form, the first five stanzas are condensed into just three. She struggled briefly after "cast dark" before continuing onto "Hooks". Then when she gets to the line "Black sweet blood mouthfuls!" something changes in the way the poem develops, at least the appearance of Plath's handwriting. Immediately after "Black sweet blood mouthfuls!" Plath writes "Something else" and from this point on the first page of the first draft races toward its conclusion. The handwriting is quite different and Plath would take a few more sheets of paper to get the poem to its final state. But the manuscript is amazing in its ability to be a sheet of paper which ultimately affords its reader the opportunity to re-live the poems' genesis and to therefore watch it develop into a thing of beauty. In the last hours of the course "Editing Sylvia Plath's Correspondence" we read our letters in class. Backing up just a bit, on Monday, Karen asked the students to give an adjective to describe Sylvia Plath as they saw her. This was done, keep in mind, with each of the students having either no, or little, or slightly more familiarity with Plath's works and her life. And, it was done before we were assigned her letters to read and transcribe. The words were: dark, beautiful, perseptive, complicated, brilliant, sensitive, driven, tragic/intense, trapped, passionate, cynical, motivated, gloomy, and frugal. I think it is worth mentioning which letters were transcribed this week. To Hans-Joahcim Neupert (all letters written from Wellesley): 13 April 1947, 24 September 1948, 20 December 1948, 29 January 1949, 14 April 1949, 4 July 1949, 10 October 1949 (enclosing poems: "White Phlox", "Gone is the River," "The Farewell," "The Stranger," and "City Streets" and giving authorial comments about each), 28 November 1949, 2 January 1950, 20 February 1950, and 30 May 1950. There are more letters to Hans-Joachim Neupert, but those are the only ones we transcribed in class. Today we revisited those adjectives to see if after working with Plath's letters and learning a bit about her biographically, contextually, etc., seeing her typewriter, prom dress, girl scout uniform, hearing her own voice read "Ariel"...or, after working "with" her. Most of the students stood by their original adjectives, but some changed to more positive sounds descriptive words like driven and fearless. In the course of reading the letters, we learned that the letter to Sally Rogers, which was recently acquired, where Plath is promoting Smith was written from McLean. Previously they had just the letter to Enid Epstein Mark, so the addition of the Rogers letter doubles their holdings! It was an amazing week. Thank you to Karen for letting me sit in; thank you to the students in the course for making me feel welcome; thank you to you all for reading! The archive today was fun. Karen Kukil had Plath's Royal typewriter out for someone else to photograph, so she and I started typing on it. We were comparing the way it typed against some of the documents Plath created on it, circa 1953 when she obtained it. Plath was quite proficient and efficient on the typewriter...I am not. In the process of working with it, I typed the first sentence from Plath's 19 June 1953 journal fragment, which was typed in New York City during her guest editorship at Mademoiselle. It is probable that Plath typed that fragment while at the offices of Mademoiselle, but it could be that it was typed in her hotel room (room 1511) at the Barbizon Hotel. This line I typed was "All right, so the headlines blare that the two of them..." (see Appendix 4, page 541 of The Unabridged Journals). For the rest of the morning I worked with Plath's personal papers, including her address book, her 1962 Calendar, and other items. I had looked at these before, but as ever, there were some items contained in this series of documents that took on a new significance. As a result, I was able to add a couple of books to Plath's library on LibraryThing based on evidence that she used them. In the afternoon, for the Plath editing course, we went to meet with the reference librarian and got to work with online resources to identify people, places, etc. (there were some print options, too). And then we went to the College Archives to work with records from Smith Colleges amazing history. This included the course and student directories to identify courses Plath took and people that she may have mentioned in her letters. As I had nerded out and done the majority of my annotations previously, I spent most of my time browsing old issues of The Sophian and Smith College Associated News (SCAN)! A vast, amazing resources to identify news and names and issues going on around the campus and town during Plath's years as both an undergraduate and professor. In the archive this morning, I revisited some of Sylvia Plath's papers which I have studied before. I find that revisiting certain series of documents benefits my understanding of how it all fits together - her life, her creative productivity, etc. - and the perspective of time and continued research and learning can be quite beneficial to seeing how the individual, disparate "things" add up to a connected life. This morning began with a browse through Plath's short stories and reviews. And most of it I had seen before, but there was one folder that was completely new to me. It is possible I missed it in a previous research trip; it is possible that it was added after the last time I looked it. Who knows; a wonderful aspect to the Sylvia Plath Collection at the Mortimer Rare Book Room - and likely other archives as well - is that it is still growing. Those little pieces, those traces, of Plath's life continue to be located and in some instances they are reunited to a larger Plath collection. After this, I browsed through the box of correspondence Plath received. 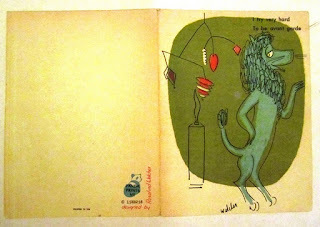 This was followed by, for the first time ever, looking at the box of Plath's artwork. Inspired by the recent exhibition of her artwork at London's Mayor Gallery, I wanted to see some of the other pieces Plath created. The whole gamut is here: from undated to crayon drawings from the early 1940s up through that famous collage of hers, which was reproduced on the cover of Robin Peel's excellent Writing Back: Sylvia Plath and Cold War Politics. 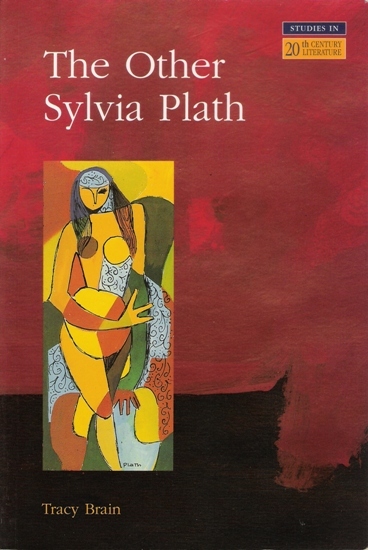 I saw, too, the original "Study of a Woman" which graced the cover of Tracy Brain's superb The Other Sylvia Plath. This one was even more striking to me in the original than when I view it on Tracy's book and I think the reason it that is is in stark white matting; it made the colors pop. This morning, before coming to the archive, I took a little walk around the area to see a few houses that Plath may have known. The first house was that of Leonard and Ether Baskin at 108 C South Street. This is a small set of buildings set back off the road. I could not sort out which was the C unit, but the picture here should give an idea of the place. Nearby, and in the shadow of Sage Hall, was the house where Paul and Clarissa Roche lived at 27 Belmont Avenue. A nice house, as can be seen here. The Baskin's house (right) was one I was particularly keen to see as it was a stop on Plath & Hughes' cross country tour in the summer of 1959. Plath and Hughes signed some offprints of "Sculptor" and "Roosting Hawk" ["Hawk Roosting"] for them and dated it 7 July 1959. For more on the July/August trip, please read or re-read David Trinidad's terrifically detailed "On the Road with Sylvia & Ted: Plath and Hughes's 1959 Trip Across America". This afternoon the "Editing Sylvia Plath's Correspondence" class included a field trip and and the rare opportunity to walk out of the room - with permission - with an original Plath document. The field trip continued my indoctrination as a "Smith Girl" (aka a "Smithie"). 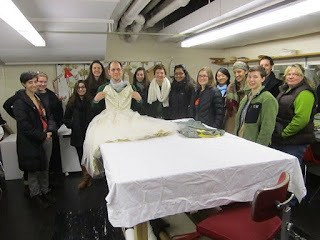 We walked over to the Historic Costume Collection and got to look at Plath's 1953 Prom dress, which she wore to the Yale Junior Prom with Myron "Mike" Lotz. Additionally, they have her circa mid-1940s Girl Scout Uniform. In a research trip to Indiana a few years ago I was able to hold clippings of Plath's hair which adds a completely different dimension to her. Working with her papers gives a sense of her methodology of production. Seeing something that she wore adds now a physical dimension to her which is something we can comprehend from photographic images: but that medium is limiting. Seeing the actual thing dress she wore? Can't describe it. But, Plath did. On 1 March 1953 (Page 177 of The Unabridged Journals), Plath wrote: "sunlight raying ethereal through the white-net for the new formal bought splurgingly yesterday in a burst of ecstatic rightness...silver-winged bodice of strapless floating-net gown: it is unbelievable that it could be so right!...I want to be silvery beautiful for him: a sylvan goddess." We paired up after this field trip to read and edit our letters. My reading partner and I left the room, with permission, with two letters Plath wrote to Phil McCurdy. Reading and editing the letters was an interesting process that gives a good insight into the care and concentration involved with documentary editing. The morning begin with a browse through the drafts of Sylvia Plath's poems. I started with the box with poems beginning "A-Be". I wanted to look a bit through some of the early October 1962 poems, and so looked at drafts of "The Bee Meeting" and "The Arrival of the Bee Box". As might be expected, this led me to jump the alpahbet so as to review "Stings," "The Swarm," and "Wintering. When you work with the original manuscripts, it is like reading them for the first time; you see them new and fresh. And when you work through the drafts of the poems, you are on a journey. I wanted to look at these early October 1962 poems to see if an idea I have for a paper to write and present at the Plath Symposium in October might spring to life. I'm happy to say I have an idea, I'm not very pleased to say I'm not sharing at this time. In the process of reviewing the poems I stumbled upon, in the next box "Bi-De," a folder labelled "The Bull of Bendylaw." In this folder I found an answer to the question posed last night as regards the full table of contents for the one time collection of poems. Indeed the books full contents, and more, is captured in this list. Many of us who have worked with Plath's papers know that she kept meticulous lists of submissions, both of her own work and that of her husband. This particular typed table of contents for "The Bull of Bendylaw and other poems" was made on pink Smith College Memorandum paper. In addition to the poem titles, Plath lists the name of the periodical in which the poems were submitted and, if accepted, where it appeared. For the most part these are in code, usually of two or three letters, for example "vq" is Virginia Quarterly; and "pr" is Partisan Review. The numbers do not quite add up (Plath says the book contained 45 poems, but there are far more on the list she kept). Part of the reason for this is that her list includes many of the poems Plath composed later in 1959 at Yaddo in Saratoga Springs, NY. But rather than being a discouragement, what we actually see is the evolving book that would become The Colossus. However, some are typed and some are handwritten and below I will clearly list which is which. The typed poems on the list are: "A Lesson in Vengence", "Faun", "Sow", "Spinster", "Black Rook in Rainy Weather", "Hardcastle Crags", "Mussel Hunter at Rock Harbor", "The Ghost's Leavetaking", "The Times are Tidy", "Frog Autumn", "Departure", "Snakecharmer", "The Disquieting Muses", "Owl", "Full Fathom Five", "Lorelei", "The Companionable Ills", "The Hermit at Outermost House", "The Bull of Bendylaw", "On the Decline of Oracles", and "Stumpet Song". At the top, "A Lesson in Vengence" has next to it a note indicating that it is to be removed. There is an double space at this poing in the list, and it continues, typed: "Maudlin", "All the Dead Dears", "The Moon was a Fat Woman Once" ["The Thin People"], "Green Rock, Wintrhop Bay", "Landowners", "The Goring", "Ouija", "Moonrise", "Sculpture", "I want, I want", "Night Shift", "The Beggars of Benidorm Market", "Point Shirley", "Suicide Off Egg Rock", "The Ravaged Face", "The Other Two", "Electra on Azalea Path", "Metaphors for a Pregnant Woman", "Man in Black", "Two Views of a Cadaver Room", and "The Eye-Mote". In the list "The Other Two" is completely struck out. Below this, handwritten, are the following: "Aftermath", "In Midas Country", "Medallion", "The Beekeeper's Daughter", "The Colossus", "The Manor Garden", "Mushrooms", "A Winter Ship", "The Burntout Spa", "Poem for a Birthday", and "Blue Moles." A second column contains, also handwritten: "Midas Country", "Polly's Tree", "The Sleepers", and "Two Views." There are some differences in the abover versus what I typed up yesterday; for example "Mad Girl's Love Song", "Rhyme", and "Tinker Jack and the Tidy Wives", among others, are not present. It appears that the book changed shape quite a bit as the previous version contained a number of poems likely included in earlier book assemblages. I think of her "Cambridge" manuscript "Two Lovers and a Beachcomber by the Real Sea" which she submitted as part of her Tripos in June 1957; Plath also sumbited a book by this title to the Yale Series of Younger Poets, also in 1957 (see 9 August 1957, page 294 of The Unabridged Journals). by Plath to McCurdy, March 1954. In the afternoon we got into the nitty-gritty of the course and we were each assigned at least two letters to transcribe. The two letters given to me were to her German pen-pal Hans-Joachim Neupert from 4 July 1949 and to Philip McCurdy, 3 March 1954. The first was a four page, handwritten letter and the second was a typed on a birthday card. The card itself was cute. On the front it reads, "I try very hard / To be avant garde." On the inside, printed, it reads, "To keep abreast / Of the very best / In contemporary art and thought / And so I feel I really ought / To find some method tres nouveau / To show you that I really know / The very newest way / To say / Happy Birthday." Plath signed the card and then in order to read the letter she typed you had to open the card all the way up (the original sheet of paper was quarto in size and folded in half, and then folded in half again. The letters were great fun to transcribe and I began annotating them based on information either in my head or that was readily available. On Thursday we are going to the College Archives to get primary source material that will help us with the Smith College related letters. This morning was beneficial to the paper I am writing on The Bell Jar as I was able to verify some information against Sylvia Plath's typescripts. The Sylvia Plath Collection has a few early, partial drafts, and then a complete set of "later drafts" which maybe could be considered final drafts as one of them was used by Heinemann when they set the type for the book. One of the things I looked at sadly revealed that Plath submitted the typescript with a typographical error. This does not change my opinion of Plath; but it confirms her humanness. And, when it comes to the word she spelled wrong, one can hardly blame her. The word is "bababadalgharaghtakamminarronnkonnbronntonnerronnruonnthu-nntrovarrhounawnskawntoohoohoordenenthurnuk!" And it appears on page one of Finnegan's Wake. Plath's copy is held by the Mortimer so I was also able to work with the "thick book," which Esther tells us "made an unpleasant dent in my stomach" (130). That was basically all I wanted to do today, but as I was browsing the finding aid I thought about Plath's pre-Colossus attempts to publish a book. Her Unabridged Journals tell us that she formed and submitted a number of books of poems including "The Bull of Bendylaw" which became "The Devil of the Stairs." Her "The Bull of Bendylaw" was submitted contained 45 poems, which at the time (13 May 1959) had seen all but 13 published. The books full contents are not known, but some of them are: "Natural History", "Landowners", "Green Rock, Winthrop Bay", "Mad Girl’s Love Song", "On the Decline of Oracles", "Owl", "Rhyme", "The Bull of Bendylaw", "Apotheosis of an Avenging Lover" ["To a Jilted Lover"], "Recantation", "Tinker Jack and the Tidy Wives", "On the Plethora of Dryads", "Poems, Potatoes", "November Graveyard", "The Hermit at Outermost House", "The Disquieting Muses" , "Medallion" , "Two Sisters of Persephone" , "In Midas’s Country", "The Goring", "The Companionable Ills" , "Electra on Azalea Path", "Moonrise" , "Spinster" , "Frog Autumn" , "Mussel Hunter at Rock Harbor" , "Ella Mason and Her Eleven Cats" , and "The Ravaged Face". As Plath weeded and changed the book, some of the poems were eventually published in The Colossus. How does this book - or fragment of a book - compare to what was published in 1960 (Heinemann, London) and 1962 (Knopf, New York)? Not a question I can answer but it is something to think about. In her journal entry for 18 May, when she changed the title to "The Devil of the Stairs" Plath says that her previous title was "catching, had an obscure point, the idea of energy breaking through ceremonial forms" (483). In changing the title to "The Devil of the Stairs" Plath comments that this title "encompasses my book & 'Explains' the poems of despair, which is as deceitful as hope is" (483). 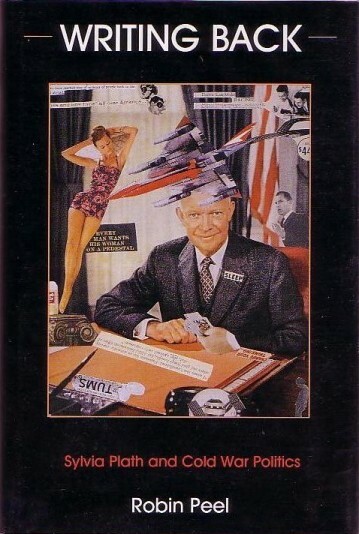 As we know a book by either title was subsequently abandoned. One abandoned Plath poem that I have often wondered about is "Mules That Angels Ride"! I know! The title is from a line in part VII of Wallace Stevens' "Le Monocle de Mon Oncle". In Karen Kukil's Unabridged Journals, the index lists this as a provisional title, which Plath planned to write during her spring break from teaching in 1958. We know she turned to ekphrastic poetry, writing on Klee, Gauguin, etc. She planned to write "on a new poem" which was for a contest. She saw it as being 350 lines and as an "exercise to set me free" (350). Plath saw the poem as containing the "naturalness & implicit form (without glassy brittleness)" that she said affected "Black Rook in Rainy Weather" (350). Plath later said that "Mules That Angels Ride" would be "about the spirit, luminous, making itself manifest in art, in houses, and trees and faces" (352). While Kukil says this is a provisional title, by 28 March 1958 Plath had sent out "a group of eight poems, seven of them new, under the title 'Mules That Angels Ride' to a Wallace Stevens Contest" (357). Of the group of poems, Plath writes of them that "the vision arrives astride the symbol, the illumination comes through a mask of mud, clear and shining" (357). But, what are the eight poems that comprise "Mules That Angels Ride"? For the "Editing Sylvia Plath's Correspondence" class we watched the Biography channels' "Sylvia Plath" program from a few years ago, talked about Plath, answered student questions, and watched a portion of the Smith Symposium from April 2008 in which Plath's friends read portions of letters they received from their friend. This served to illustrate just how varied Plath's letters are and how she was funny, personable, and knew how to write something based on the audience and/or recipient. She was much, much, much more dynamic a letter writer than, say, Letters Home, shows. Tomorrow we will begin the process of editing and transcribing the letters. I'M A SMITH GIRL NOW! "This course will teach students how to edit correspondence. Focusing on the Sylvia Plath Collection in the Mortimer Rare Book Room, students will read and edit Plath's unpublished letters. Technical aspects related to the editing of a text will be discussed, including transcription and emendation. Plath's poetry and prose manuscripts, journals, annotated library, and other biographical material will also be considered during the course, as well as her papers in the Smith College Archives. Each student will be required to transcribe and edit one letter from the Sylvia Plath Collection. Whenever possible, footnotes will be based upon primary sources." I will be auditing the course in the afternoons and spending time in the mornings in the archive with the Plath collection. I will try to report back each day as I did when I was at Indiana in January 2010 (see posts for 11, 12, 13, 14, 15, and 16 January). One of the things I am working on will involve studying drafts of The Bell Jar for a paper I hope to publish in Plath Profiles 5 this summer. For the rest of the time, who knows! Fairleigh Dickinson University Press has recently published Poetic Memory: The Forgotten Self in Plath, Howe, Hinsey, and Glück by Uta Gosmann. The Plath chapter, chapter one, is called "Sylvia Plath: Re-membering the Colossus." A few articles to pass along today. First the new one: In Issue 2 (Winter 2011) of the Ted Hughes Society Journal there is Amy Hildreth Chen's "The Perils of Literary Celebrity: The Archival Stories of Ted Hughes and Sylvia Plath." An excellent read and one that survey's the history of biographical approaches to Plath and Hughes as well as those who act as custodian to her papers - both the estate and later the archives. Chen's paper is on pages 20-31. Two additional articles that are slightly older but worth your while are by the Jungian analyst Susan E. Schwartz, Ph.D. You may also be familiar with Dr. Schwartz's paper, "Sylvia Plath: A Split in the Mirror," from Plath Profiles 4. Abstract: Although the Puella character can form within the psyche in various ways, this perspective focuses on the effect of the absent father, the absorbing mother who is emotionally distant and Puella who is without sufficient connection to her ground of being, especially the feminine aspects.. Descriptions of Puella are particularly clear in the work of poet Sylvia Plath, who killed herself in the early 1960’s. Plath who herself went through analysis, is used here as an extreme example of Puella. Her poignant and violent psychological struggle illustrates the cultural and trans-generational shadows of the Puella archetype. Like many poets, her work reveals the shadow life within an individual and a culture, in both personal and archetypal dimensions. Abstract: Puella is the eternal girl, an aspect of the psyche that has been virtually ignored in the Jungian literature. She appears in the Western attitudes to be ever younger and thinner, devalued and stuck in the shadow of the patriarchy. Living 'as if', she is bolstered by persona adaptation, masking the emptiness within, experiencing but not facing the narcissistic wounds. The attachment problems result in a distorted and split self-image, divorced from her body, and difficulty with intimacy and commitment. The dreams and writings from the American poetess Sylvia Plath illustrate parallels with the Puella figure. In late October 2012, Indiana University Bloomington's Department of English will host the Sylvia Plath Symposium 2012 commemorating "50 Years of Ariel" -- notably, the October poems of 1962. The focus will be on "Inspiration and the Creative Imagination" and featured speakers and artists now in place will present on "Daddy" and "Lady Lazarus" in relation to German language, WWII and their controversial uses of the Holocaust; the Bee sequence poems; biographical references in the October Poems; the new Plath biographies; 21st century Plath literary criticism and creative responses; "memoirs" of Plath readers on how she changed their lives; critical thinking and the contemplative tradition in Ariel; and the Plath Lilly Library archives and the creative process. The Call for Papers will be out in January 2012, and a website with program details will be up in March.